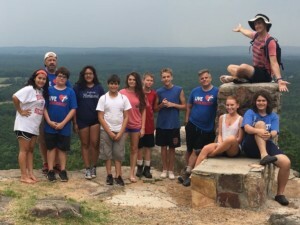 In June, Pastor Phifer and four other adults also went up on a mountainside with 12 of the youth from Grace Lutheran Church in Pensacola, for a hiking trip on the Appalachian Trail in Georgia for six days. They carried their own 40-pound packs. On the first day, they walked nine miles in the rain and wind and slept in tents (wet, I might add). After the first night, they camped in the Franklin D. Roosevelt State Park, hiking different trails each day into the great outdoors. They carried dehydrated food, granola bars, and trail mix. When in the base camp they had their own cook, who fed the group using his Coleman stove. One day, at a lovely waterfall, one of the young adults was baptized, beginning her new Christian life. Each day included prayer and devotion, either before they hiked or on their return to base camp. A great adventure was had by all.